AG Consulting Partners is honored to support many of its employees’ philanthropic ventures. This past month, Consultant Hannah Starcevich lead a unique charitable initiative to empower young girls around the world to rise to their greatest potential. Sadly, one of the greatest barriers women in developing nations face is their monthly menstrual cycle. Without menstrual care solutions, such as pads or tampons, women are forced to stay home. This results in missed education and work opportunities for 5-7 days each month. These women quickly fall behind and drop out, impacting their lifelong ability to support themselves as independent women. Hannah partnered up with an innovative non-profit, Days For Girls that has provided menstrual health and education solutions to more than 1 million girls and women in 124 countries around the world. The Days for Girls Menstrual Kits are comprised of 2 reusable pads and absorbent liners that are hand sewn. By arming women with the knowledge and tools they need, the Days for Girls solution is a low-cost, high impact program. Over a one-month period, Hannah raised $3,000 to purchase Menstrual Kits for 220 women. 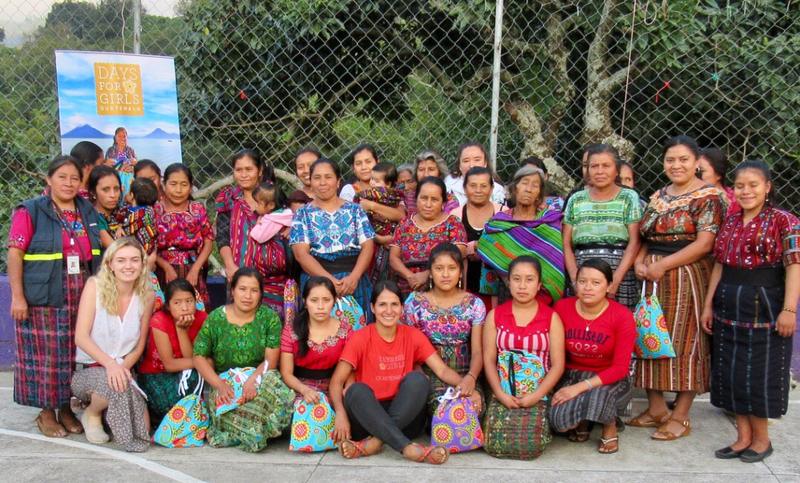 Then, she traveled to Panajachel, Guatemala to purchase the Kits that were hand-made by a local Days for Girls team. Together with the local Days for Girls chapter, Hannah delivered the kits to women in surrounding villages and lead a two-hour seminar to teach women about menstrual and reproductive health. — “My goal was to meet the women that would receive the kits and learn about the issues they face. Alba, the local Days for Girls lead, facilitated a powerful discussion that was both educational and light-hearted to shed light on a sensitive subject that is normally awkward and taboo. Education gives us the power to make informed decisions about our health and family planning. A simple tool and enlightening conversation can allow young women to remain healthy and stay in school. The money I was able to raise also supported the local economy and Days for Girls enterprise. It was an amazing opportunity to meet the young women that hand-sew the kits and learn about their passion for supporting women in the community.